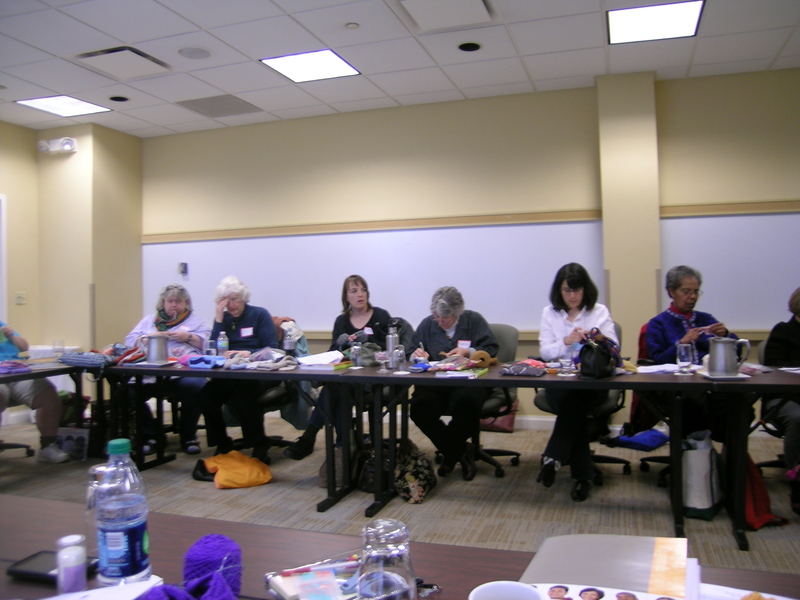 Friday, Saturday and Sunday I spent the whole day taking classes with CookieA through the Windy City Knitting Guild. The lessons were divided up among 3 1/2 day sessions, and originally I was going to piecemeal different classes together. However, the drive out to Skokie is not a pleasant one, and I decided to stay the full-time each day. I am glad that I did, as I learned something new in each class, and had a fabulous time. I cannot say enough good things about what a great teacher she is, good sense of humor and genuinely nice. 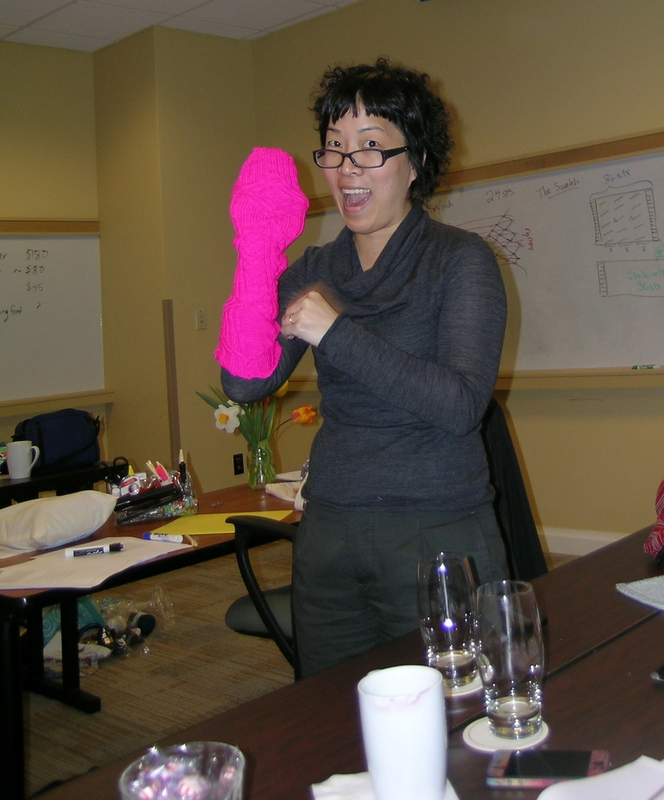 Friday Morning: Sock Innovation: Top Down Sock Design Loved this class!!! Taking this class has given me the confidence to tackle designing a sock, that is when I have the time, finish UFO’s and have some needles free. Friday Afternoon: Flat to In-The-Round and Back Again This was one of the classes that I was waffling on, and it turned out to be my favorite of all the weekend. Sometimes the descriptions and titles do not really convey what you will get out of the class. Cookie is fabulous with breaking down problems into manageable math solutions, and gives great handouts that clarify what she is talking about in the classes. This was one of the classes that I was going to skip, and am happy that I did not, as it turned out to be one of my favorites. Learning how to take a written pattern and chart it, how to take a pattern written in the round and transcribe it to flat and visa-versa. 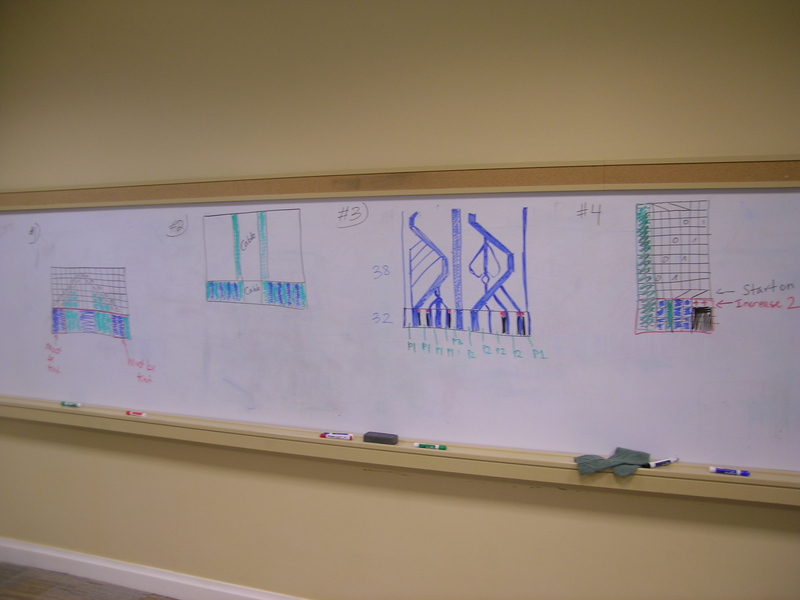 She had a great whiteboard to write on, and filled it up with very clear diagrams. Saturday Morning: The Perfect Rib Another great class, and one that will help me to get that seamless rib into pattern look that Cookie is so well-known for on her sock design. This was very well thought out and the handout, as usual, was superb. Saturday Afternoon: Cable Suckage Factor Don’t be turned off by this name. 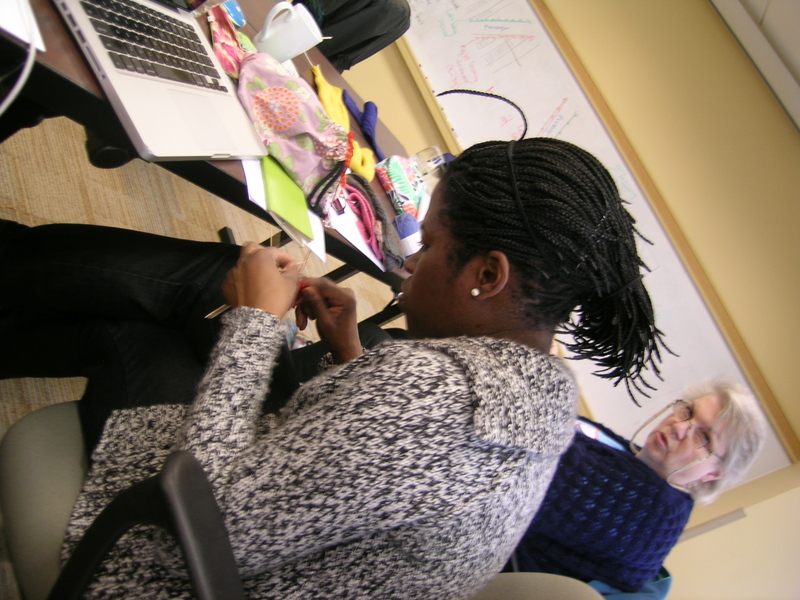 The purpose of the class was to come up with our own personal cable “suckage factor”, so that we could both modify patterns for fit and design those that would fit. 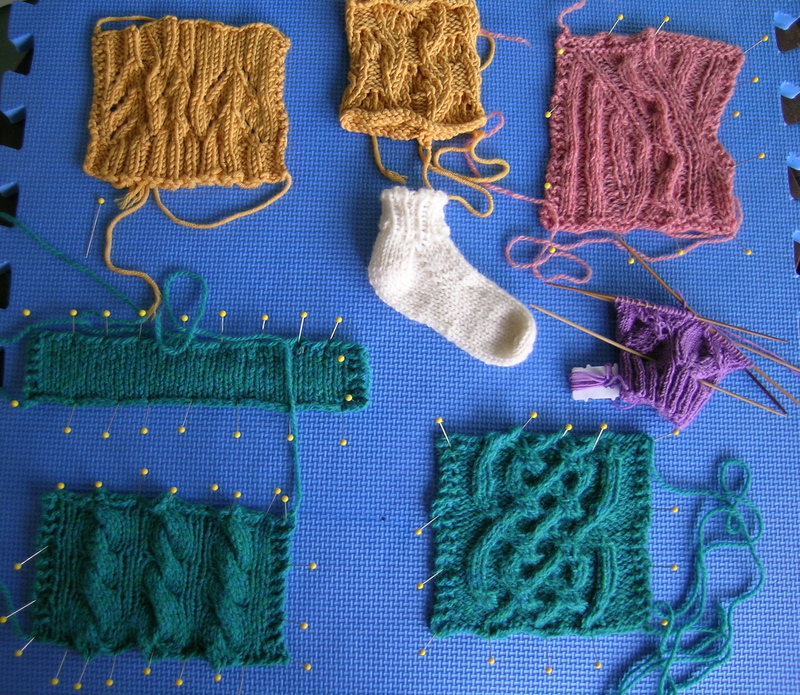 We knit a plain sample swatch, and then knit 2 different cable pattern swatches to see how much pull-in we were getting as a percentage factor. Then learned how to apply that suckage % to designs to make sure that our fit is good. Suckage factors can be anywhere from 25-50%, mine was 42%. Sunday Morning: Toe-Up Socks with Gusset I am not a fan of toe-up socks and while this was a good class, it did not change my mind. We did, however, get good worksheets for figuring out the required widths and how to gauge when and how much to increase for the gusset. This is always the part that poses problems for me with toe-up socks, and I do not like the short row heel with no gusset. It just does not fit a person with a high instep like myself. Sunday Afternoon: Traveling Stitches. This class did not give me much new information, as I had already completed many of Cookie’s socks and she loves to use traveling stitches. This class combined with the cable suckage class really gave me lots of designing tools to use for socks and sweaters. Wow, your blog made me feel like I was right there! 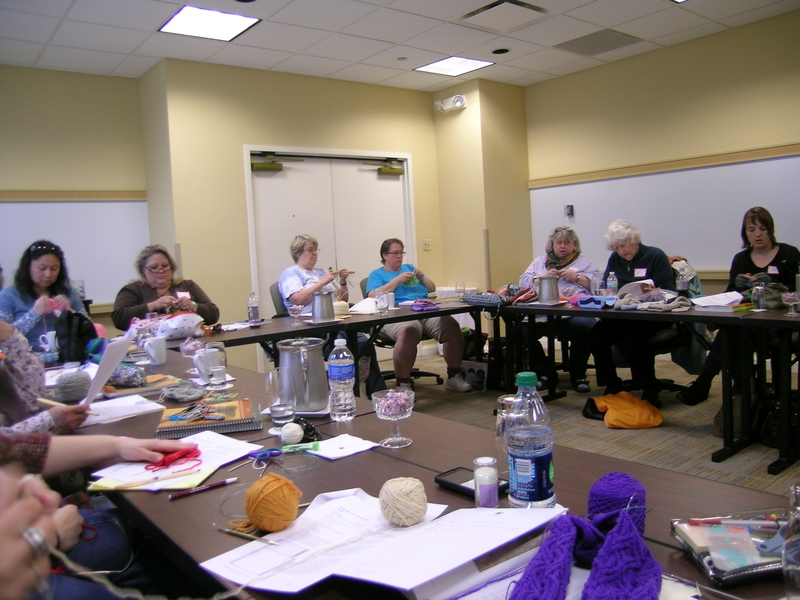 I have never gone to any kind of class for knitting etc. though I have dreamed of it. I would love to take a Cat Bordhi class! Everyone looks like they are having so much fun! Oh wow, I’m so jealous you got to take all of the classes! Thanks for sharing – She really was a fantastic teacher! I only got to take the toe-up socks class on Sunday, but totally would have taken a few more if time and money hadn’t been an issue. Also your swatches from all of the classes are gorgeous! Thank you so much. I enjoyed all of the classes, and you can attest to what a great teacher she was! ← Eco Easter and more socks!